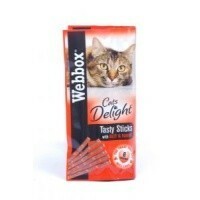 Webbox Cat Delight Treat Sticks - Beef & Rabbit is the perfect moist and meaty treat to give your cat. Made from high quality fresh meat, these tasty treat sticks have been expertly cooked to achieve a snack that your cat will find simply irresistible. Allow your cat to fully indulge themselves with this luxurious meaty snack! Meat and animal derivatives (min 4% Beef, min 4% Rabbit), minerals, various sugars. My cats love these. Great that they are individually wrapped so can be stored easily.